Note: in a 2-player game, the two players must face each other. Therefore, they each have a neutral board on their left and on their right. At 3 players, remove randomly 5 ghost cards from the deck. At 2 players, remove 10 ghost cards. Do not look at the discarded cards. Add the incarnation(s) of Wu-Feng to the deck AFTER having removed these extra cards. Remove 15 ghost cards before adding the incarnation(s) of Wu-Feng to the deck. Take one blue, one green, one yellow, and one red Tao token (1 black more in initiation mode). Take 3 neutral power tokens. Make sure the red board has the "Dance of the peaks" power visible (to enable flying). No aid can be requested from the cemetery tile, and the action of the "pavilion of the heavenly winds" allows the player to move his own Taoist. A neutral power token allows the active player to use during his a non-possessed (see below) neutral Yang phase the power of board. Such action is supplementary to his own power. A player may use several neutral power tokens in the same turn, but not for the same power. After use, a neutral power token is placed on the central tile (whether this tile is haunted or not does not affect the neutral power tokens). When a Taoist ends his turn on the central tile, he may take all or part of the neutral power tokens on this tile. It is not allowed to give neutral power tokens to another player. If a Taoist dies (0 Qi), his neutral power tokens are placed on the central tile, where they can be taken by other players, as seen above. Example. Sam is playing alone, practicing exorcism rituals. He controls the red Taoist and has 3 neutral power tokens. He may use all three in the same turn, one for the power of the yellow game board, one for the power of the blue board, and one for the power of the green board. Boards without player are called "neutral boards". Their playturn is specific in that only the two first steps of their Yin phase are carried out and no Yang phase. Neutral boards start the game with 3 Qi tokens. They may lose them but never get them back. Important: the phase 3 of the Yin phase (adding of a new ghost) is never performed fora neutral board. For each of such ghosts on the neutral board, adjust the position of the Haunting figurine according to the normal rules. For each Tormentor on the neutral board, a player must roll the Curse die and apply its effect for the neutral board (the green Taoist's power is ineffective for this die roll). Remark: if the curse die indicates "loss of Tao tokens", you are lucky as this has no effect on a neutral board. If the neutral board is filled with ghosts at the start of this step, the board loses one Qi. Otherwise, nothing happens. A neutral board that has lost all Qi tokens is called "a possessed board", Its specific power cannot be used anymore through neutral power tokens. Any further loss of Qi points (ie. board overrun or tormentor) must be endured by a player of your choice (the green Taoist's power is ineffective if Qi loss is due to the curse die). The preceding rules let you discover Ghost Stories at the Initiation level of play. 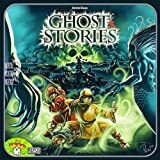 After you have triumphed over this mode, Ghost Stories provides 3 additional levels of play, which allow you to engage in new challenges by increasing the difficulty. The Taoists start the game with 3 Qi tokens, not 4. Taoists begin the game with their colored Tao token but without the black Tao token. Have you progressed? You are so daring! Discard ghost cards as explained above, if you there are less than 4 players. Then, insert randomly chosen Wu-Feng incarnation cards in the deck as follows, starting from the end of the deck. 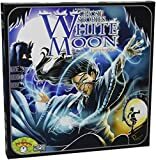 For 3 or 4 players: 10 ghosts, 1 incarnation, 10 ghosts, 1 incarnation, 10 ghosts, 1 incarnation, 10 ghosts, 1 incarnation, the rest of the ghost deck. For 1 or 2 players: 10 ghosts, 1 incarnation, 10 ghosts, 1 incarnation, 10 ghosts, 1 incarnation,, the rest of the ghost deck. The hell mode is similar to the Nightmare mode, except that the Taoists start the game without their Yin-Yang.